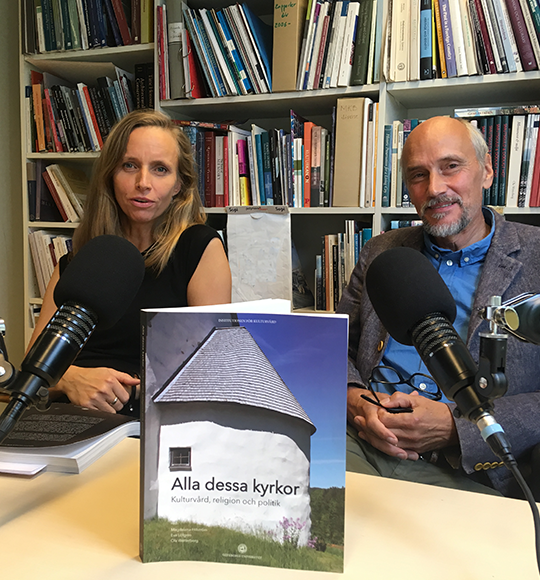 K-podd 45: Alla dessa kyrkor – hur mår de egentligen? På Göteborgs Universitet vid Institutionen för kulturvård samtalar vi med Eva Löfgren och Ola Wetterberg, som tillsammans med Magdalena Hillström gett ut en antologi som heter Alla dessa kyrkor. Hur mår de svenska kyrkorna? Vems är de? Vem bryr sig mest om dem egentligen? Forskningsprojektet Alla dessa kyrkor har fått en del av sin finansiering från Riksantikvarieämbetets anslag för Forskning och utveckling. I samband med att det här avsnittet släpptes redovisade Riksantikvarieämbetet ett regeringsuppdrag till kulturdepartementet där vi fått i uppdrag att analysera vilken effekt den kyrkoantikvariska ersättningen haft för det kyrkliga kulturarvet sedan staten och Svenska kyrkan skildes åt år 2000. En slutsats i rapporten är att de svenska kyrkomiljöerna troligtvis är i bättre skick än någonsin. Här kan du läsa rapporten. Riksantikvarieämbetet was represented at the 2nd IPERION CH Training Camp in Provins, France from 19 – 23 March, 2018. Organized by the French Laboratory of Research on Historical Buildings (LRMH) and the French National Centre for Scientific Research (CNRS), the Training Camp focused on educating conservators and heritage scientists on the theory and practical use of seven different mobile instruments designed for non-invasive analysis of cultural heritage. 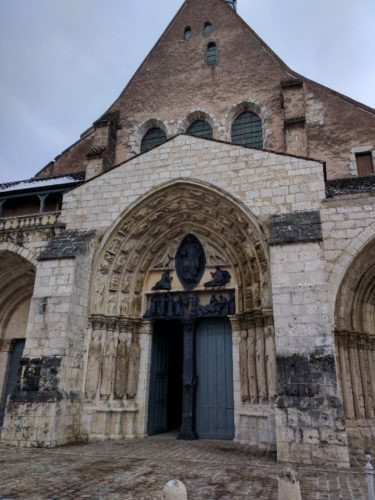 The week-long course took place entirely within the St. Ayoul Church, which provided case study material for each technique. The tools used are briefly described below. The Training Camp is part of the IPERION CH consortium (Integrated Platform for the European Research Infrastructure ON cultural Heritage), which intends to establish a multinational infrastructure of heritage science research. One major goal of IPERION CH is to provide access to scientific techniques for cultural heritage analysis. Many of these techniques are portable and are part of the MObile LABoratory network, or MOLAB. Another major goal is to provide educational outreach in the form of hands-on instrument training. All of the analytical techniques used during the 2018 Training Camp are part of the MOLAB network, and each instrument is maintained and operated by its own dedicated research group. The course was divided into lectures and practical hands-on sessions for each instrument. On the first day, each research group gave a short presentation on the theory behind its respective MOLAB tool. 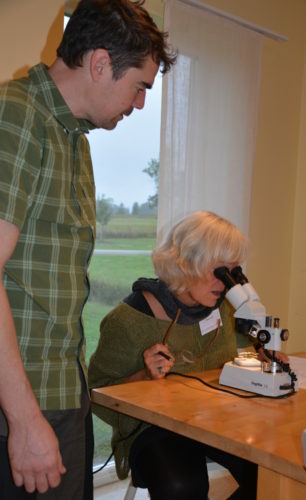 As many of these techniques are not found in typical conservation or scientific research laboratories, the presentations were necessary to establish a solid general understanding of their principles and applications. For the remaining days of the course, the students were divided into small groups and rotated to different stations within the St. Ayoul Church. 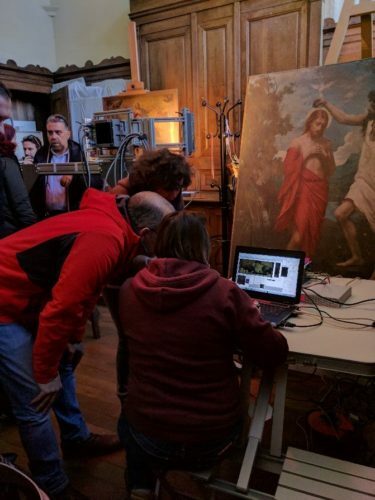 Each station focused on one particular instrument as well as a single case study in the church, providing the students with practical information on the setup, data collection, and post-processing analysis for each tool. 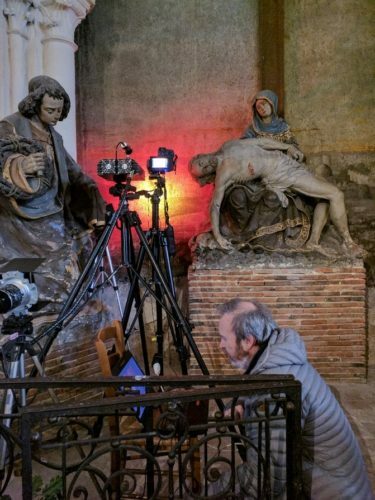 The data collected during these case studies will help with conservation efforts of the church. 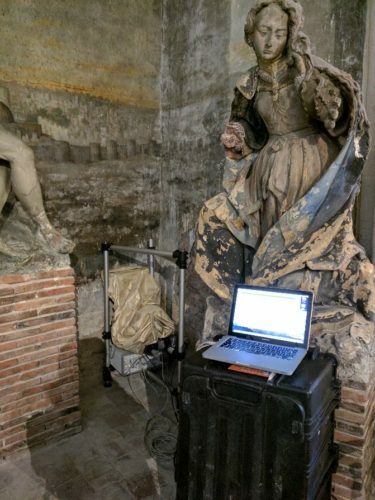 Mobile Nuclear Magnetic Resonance (NMR MOUSE) is from a research group at RWTH Aachen University in Germany and was used to assess water content in the walls of the church. Rising water and soil levels in Provins has led to noticeable water damage in parts of St. Ayoul. Using a permanent magnet and a radiofrequency coil, NMR MOUSE can provide non-invasive information on the distribution and nature of water in a material up to a depth of 25 millimeters beneath the surface. Such data indicates if the water is bound to the material (the church wall, in this case) or if it is free and can therefore be dried. 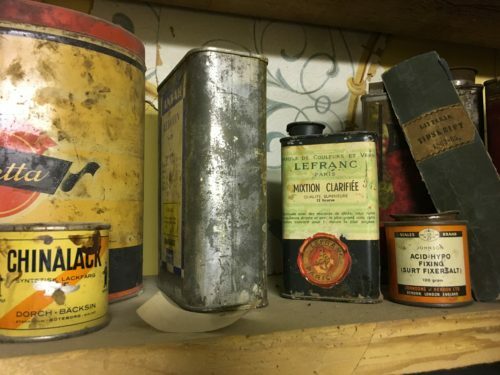 NMR MOUSE can also indicate the presence of different material layers such as varnishes, binders, and paints, but does not provide chemical characterization. Digital Holographic Speckle Pattern Interferometry (DHSPI) is from the Foundation for Research and Technology (FORTH) Institute of Electronic Structure and Laser (IESL) in Greece. During analysis, a laser is reflected off an object and subsequently collected by the instrument. 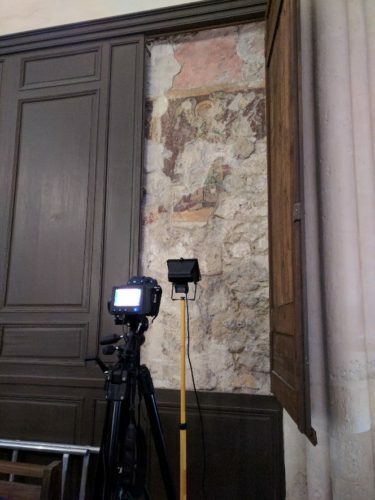 This laser provides information on active surface defects such as propagating cracks, and was used to assess the condition of a wall painting affected by water in St Ayoul. The DHSPI software produces real-time constructive and destructive interference patterns from the laser, and breaks in these patterns indicate the presence of active surface defects. DHSPI can also be used to determine the effects of temperature, relative humidity, pollution, vibrations, and loans on objects. Terahertz Time Domain Imaging (THz-TDI) is from the Center for Research on Preservation (CRC) in France and can image sub-surface layers of an object. Using terahertz radiation, this technique allows for the non-invasive imaging and depth profiling of materials and layers that cannot be seen with infrared or x-ray sources. 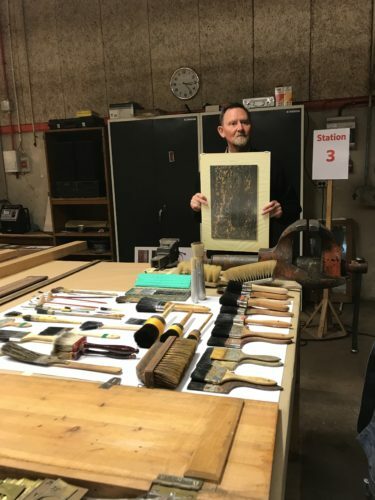 Examples of use include the identification and depth determination of a sub-surface gold leaf layer on a wall painting, and the imaging of paint and adhesive interfaces in multi-layered canvases. Stimulated Infrared Thermography (SIRT) is from CRC and involves lightly radiating an object with a heat generating light source, then imaging the diffusion of heat with an infrared camera. As different materials diffuse heat differently, this visual map provides information on the locations of sub-surface voids and air pockets in an object. The presence of an air pocket may indicate that parts of the object surface are beginning to detach from the bulk. Fragile wall paintings line the St. Ayoul Church, and SIRT helped to determine areas of the walls containing air pockets that may require stabilization treatment. Integrated X-Ray Diffraction and Fluorescence (XRD-XRF) is from Centre de Recherche et de Restauration des Musees de France (C2RMF). It combines two analytical techniques that are commonly used in heritage science research (XRD and XRF) to analyze the elemental composition and crystalline structure of materials. Both techniques are compact and portable as they are placed on a platform supported by a tripod, and both use the same x-ray source. 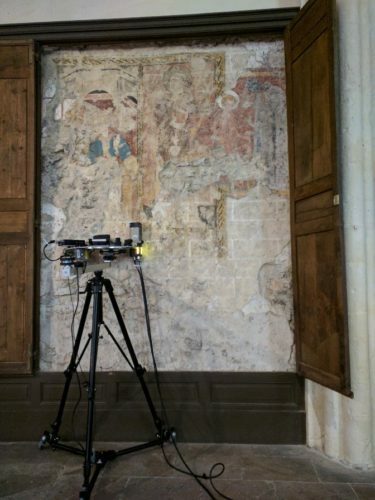 For the St. Ayoul case study, the XRD-XRF device was used to identify pigments in the fragile wall paintings. 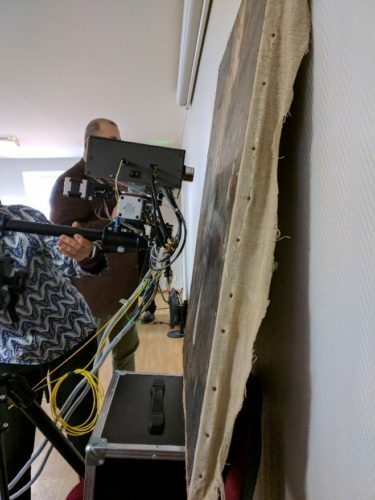 Near Infrared Hyperspectral Imaging (HSI) is from CRC and was used to image a wooden panel painting to determine areas where the painting had been treated. Using an infrared light source, camera, and an imaging spectrometer, HSI scans a large segment of the object using a pushbroom scanner, collecting a spectrum for each pixel of the imaged object. 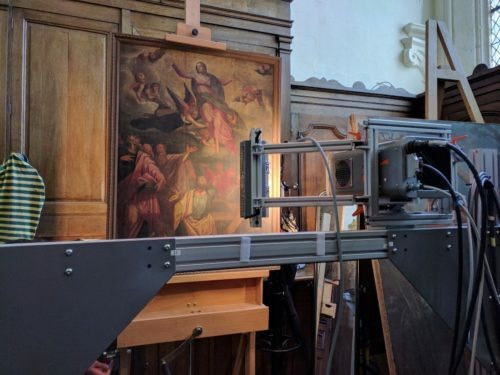 As many pigments are transparent to infrared light, this technique helps to view subsurface layers on paintings, such as underdrawings. HSI may also be performed using a visible light source which gives information on colorimetric data of an object. This can ultimately be used to monitor color changes of an object over time. Optical Coherence Tomography (OCT) is from a research group at Nicolaus Copernicus University in Poland. An infrared light source is used to illuminate an object and an interferometer assesses the light reflected back into the instrument. This reflectance data provides information on the distance of an interface from the instrument. In practice, it is used to non-destructively observe layered structures like varnished paintings and was employed to calculate varnish thicknesses in different areas of an easel painting in St. Ayoul. 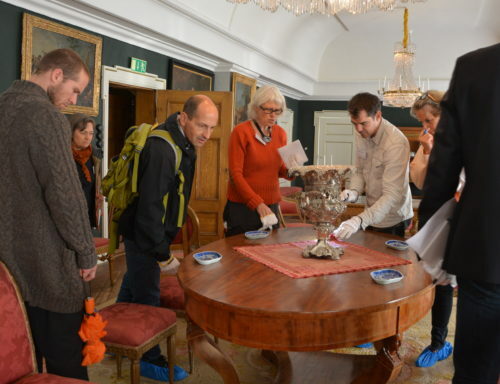 OCT can also be used to observe underdrawings, glazed ceramics, and real-time cleaning processes. The IPERION CH Training Camp was an excellent opportunity to learn more about fascinating portable techniques for cultural heritage analysis. 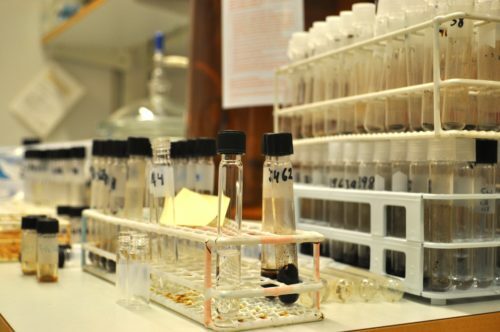 While these instruments are not common laboratory tools, the MOLAB network allows institutions to submit proposals for projects that require such specialized on-site analysis. More information about MOLAB and the proposals can be found through the IPERION CH website: http://www.iperionch.eu/molab/. I år hölls Färgforum, den sjunde i ordningen, i Malmö på gården Katrinetorp. Årets tema ”Målande förmedling- att kommunicera färg” hade samlat nära hundra deltagare, som under två dagar lyssnade och deltog i föredrag och visningar av den historiska miljön på Katrinetorp. Detta är ett kort referat från konferensen. Färgforum är Riksantikvarieämbetets årliga konferens och kulturarvets färg som arrangeras tillsammans med Statens fastighetsverk, Svenska Byggnadsvårdsföreningen, Göteborgsuniversitet, Hantverkslaboratoriet och Malmö stad. Föreläsarna på Färgforum var en blandning av målare, konservatorer, arkitekter och byggnadsantikvarier. Publiken hade också en stor professionell bredd, mycket glädjande var att studenter från grannländer hade tagit sig till Färgforum. De olika yrkesgrupperna var engagerade i diskussioner och jämförelser mellan länder och branscher. Framförallt diskuterades regelverk och bedömningssystem för linoljefärg. Ämnet kan ha varit årets hetaste potatis, inklusive den planerade nedläggningen av Måleriyrkets museum. Inledningstalare var Karin Fridell Anter, författare till en rad böcker om måleriets historia kopplat till bebyggelse. Den mest betydande boken är ”Så målade man […]” som har fungerat som läromedel ett 20-tal år. Karin beskrev måleriets idé- och ekonomiska historia i sitt föredrag och framhöll att färg kommunicerar ett lands historia ur många aspekter. Om man undersöker måleriets tillkomst som beställarens avsikter och tekniska förutsättningar, framträder information och berättelser som kommer nära dåtida maktmedel och ideal. 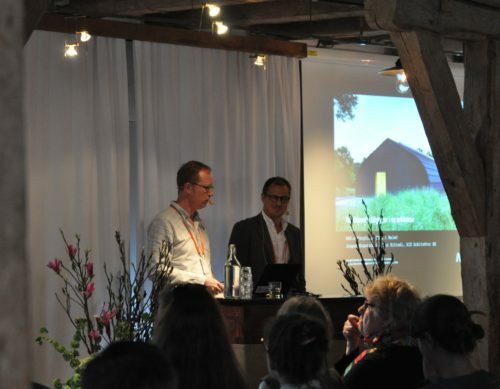 Ett mycket uppskattat inslag på Färgforum var arkitekten Jesper Engströms och byggnadsantikvarien Johan Rittséls, båda från arkitektfirman AIX, inlägg om traditionell färg i modern arkitektur. De beskrev företagets mål med att arbeta mer hållbart med fasader, framförallt med färg. De diskuterade hållbarhet utifrån miljöaspekter, färgens giftighet. Men de såg även andra värden, att förstå lokala traditioner och att göra färgval med känsla för naturtyper och miljöers egna kulörer. Detta kan man väl också kalla hållbarhet, ett medvetet ett färgval skapar omtanke och goda förutsättningar för god förvaltning. Föredraget av AIX var ett exempel på att man inom nybyggnation kan arbeta med traditionella färger och förankra hållbarhet i stora byggnadsprojekt. Inte mindre än två talare från utbildningen Kulturmålare – traditionellt byggnadsmåleri på Dacapo i Mariestad hade inlägg om traditionellt måleri. Tom Granath, målare och lärare på utbildningen, talade om hur utbildningen startades som ett svar på ett stort behov av målare som kunde föra vidare de traditionella metoderna inom måleriyrket. 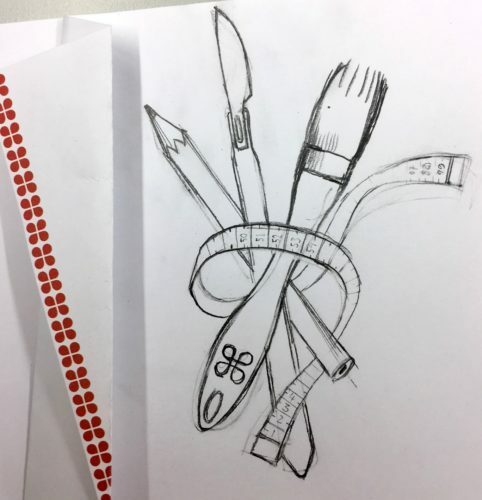 Helena Bratt, elev på kulturmålarutbildningen, tog därefter över stafettpinnen och beskrev ett mycket personligt och kreativt projekt som syftade till att skapa ett intresse för historiskt måleri. Närmare bestämt schablonmåleri och limfärg. Helena beskrev projektet Schablonladan (hyperlänk), som innebar uppmålning av förstorad schablondekor på lador längs med landsvägar med ideella krafter. Ladorna, som nu har blivit fler, har allt eftersom rönt stort intresse från både lokalbefolkning och rikstäckande press. Helena berättade att projekt som innebär samarbete och lokal förståelse har fått ett väldigt gehör, förmedlingen har haft en tydlig koppling till den mycket kreativa processen och det iögonfallande resultatet. Den avslutande paneldiskussionen bjöd upp alla arrangörer till talarpodiet. Riksantikvarieämbetets moderator Tom Sandström ställde frågor formulerade för att skapa ett samtal utifrån arrangörernas olika verksamheter och mål. Moderatorns frågor fungerade väl som uppvärmning, diskussionerna fick direkt egen fart. Återigen engagerade linoljefärg och frågor kring hur framtidens produktutveckling och byggprojekt ska kunna ta hänsyn till traditionell färg och medveten hantering. Ämne för nästa års Färgforum efterfrågades likaså. – Estetik! Hur vill vi att våra historiska miljöer ska se ut? Förslaget kom från Hélène Hanes från Statens fastighetsverk. Ett mycket intressant förslag. Det återstår att hitta en plats för nästa års Färgforum och att knyta nya samarbetsparter till vår arrangörsgrupp! Den planeringen ser vi väldigt mycket fram emot. Sist men inte minst: Tack Katrinetorps personal och Malmö stad för möjligheten att ha konferensen gården och för den fantastiska miljön och servicen. Hur ska man måla historiska objekt när de traditionella färgtyperna inte finns tillgängliga? Hur stor roll har förbehandlingen av metallen inför rostskyddsmålning? Dessa frågor ställdes på Färgforum 2017 som hade temat teknisk färg. 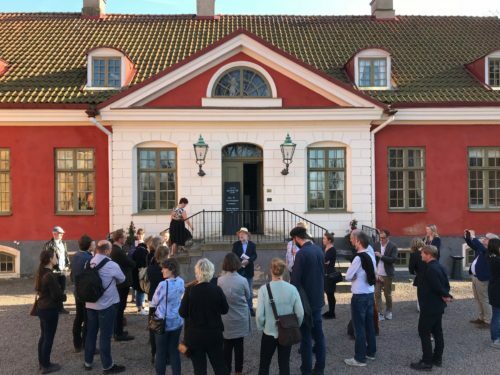 Konferensen arrangerades av Riksantikvarieämbetet i samarbete med Svenska Järnvägsmuseet, Statens fastighetsverk, Svenska byggnadsvårdsföreningen och Hantverkslaboratoriet. Riksantikvarieämbetet vill öka och sprida kunskapen kring teknisk färg som i vissa fall är svåranvända, problematiska vid konservering och dåligt dokumenterade ur bevaringssynpunkt. 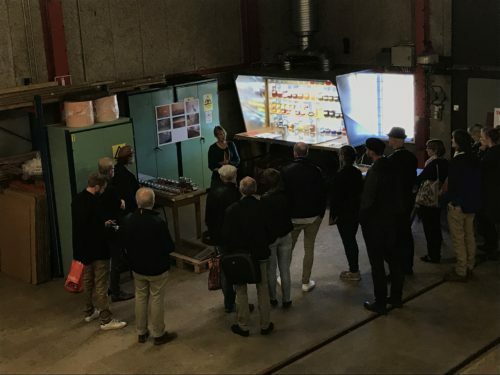 De tekniska färgerna används inom industrin, byggnadsvården och för brandskydd i kulturhistoriska byggnader. Det visade sig finnas en stor nyfikenhet kring teknisk färg och en vilja att diskutera metoder och olika färgsystems för- och nackdelar. 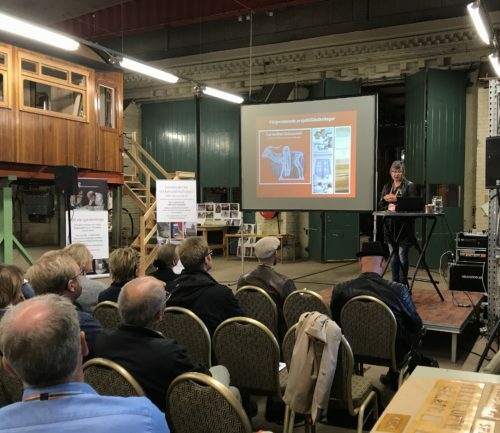 Konferensen hölls i museets fordonsmagasin där det bedrivs restaurering och forskning kring historiskt vagnbyggande och bevaringsarbete. Miljön upplevdes som inspirerande och värdarna visade en ambitiös verksamhet som vid konferensen sjöd av liv. Anna Lindgren, chef för kunskapsavdelningen, berättade mer i detalj kring verksamheten i verkstaden. Museet har 10000 m2 utställningsyta. Stora resurser krävs för att hålla samlingarn i gott skick. Färgforums talare och deltagare kom i högre grad från byggnadsvården och från tillverkarhållet än tidigare år. Talarna var museiintendenter, byggnadsantikvarier, arkitekter och konsulter inom rostskydd. Materialtyperna som presenterades var rostskyddsfärg och brandskyddsfärg och fallstudier blandades med närstudier av materialen. Första talaren var Katja Meissner, byggnadsantikvarie med verksamhet på Öland, som beskrev ett stort projekt i Leksand med rostskyddsbehandling av smidda gravvårdar. Meissner beskrev den svåra balansgången mellan konserveringsetik, länsstyrelsens krav på val av traditionella material och metoder och begränsad budget. Meissner kallade restaureringen för massrestaurering, med glimten i ögat, och beskrev projektets kreativa metoder för att få ett så gott resultat som möjligt. Meissner underströk att större prioritet borde läggas på underhållsinsatser, då behöver inte vårdinsatserna bli lika pressade och omfattande som vid detta projekt. Arja Källbom, doktorand på Uppsala universitet, beskrev grundläggande hur rostskyddsfärg av olika typer fungerade. Genomgången gav en behövlig kunskapsbas inför navigationen mellan de olika färgtyperna som skulle presenteras under konferensen. Källbom framhöll vikten av förarbete av metallen och hur färgen applicerades, för att färgskiktet skulle ge ett varaktigt rostskydd. Konferensen hade en talare från Nederländerna, konservatorn Angelique Friedrich. Friedrichs hade liksom Källbom fokus på rostskyddsfärg och färgskikts uppbyggnad, men ur ett APR-perspektiv, där olika rostskyddsfärgers koloristiska funktion inom arkitektur lyftes fram. Friedrichs fokuserade på aluminiumfärg som blev en trendfärg under 1930-talet och kom att användas som ytskikt endast för sin märkvärdiga metallglans skull. Jakob Strömholm från HOS arkitekter och Johan Rittsél från AIX hade varsitt inlägg om brandskyddsfärg i kulturhistoriskt värdefulla byggnader. Strömholm och Rittsél lyfte fram en produktgrupp som det visade sig finnas väldigt lite kunskap om, både vad gäller faktiskt innehåll och hur färgen påverkar miljön och hur färgen bryts ned. Brandskyddsfärger och dito lacker används i stor utsträckning i historiska miljöer på strukturer som är särskilt känsliga, som dörrar och bärande strukturer i järn. Fallstudier visade resultat som publiken visade stort intresse för att följa upp och undersöka vidare i avgränsade studier. Hållbarhetsaspekter var genomgående tema under konferensen. När färg blir för hållbart kan det skada omgivande material. Mycket starka material kan också vara giftiga, och många exempel på giftiga färger gavs under konferensen. Maria Dalin från Arbetsmiljöverket hade en välbehövlig presentation av personligt skydd på arbetsplatsen. Vi kulturvårdare tänker ibland mer på att vårda miljöer än oss själva! Läs Arbetsmiljöverkets material om arbetsmiljö och ta ansvar för personlig hållbanarhet, uppmanade Dalin. Vad har vi lärt oss om teknisk färg? Vid slutdiskussionen med konferensens samarbetspartners kretsade samtalet kring vikten av forskning kring de moderna färgtyperna som nu används frekvent i historiska miljöerna. Samtidigt lyfte man fram nödvändigheten i att förhålla sig öppen för nya lösningar inom kulturvården. För de som ansågs vara moderna färger och traditionella färger och metoder för en tid sedan, har nu blivit relativt traditionella. Men samtidigt som den diskussionen pågår, kommer det ut nya produkter och metoder som behöver värderas. Thom Olofson, projektledare för Järnvägsmuseets vagnrestaurering och målare, gav samtliga deltagare en funderare kring vad som händer när kunskapen om de traditionella färgerna och metoderna inte bevaras. Utan handens kunskap blir åtgärder med i historiska miljöer och med fina traditionella material förfelade. Kulturavet är beroende av sina hantverkare! Sammanfattningsvis var konferensen präglad av en stor nyfikenhet kring hur de tekniska färgerna ska hanteras, bevaras och kombineras i arbetet med kulturmiljöer. För traditionella och moderna färger har var för sig styrkor och svagheter, och behöver medveten användning. Fördelen med de traditionella färgerna är att vi känner till dess svagheter. De moderna färgtyperna är sämre dokumenterade. Många på konferensen menade att uppföljning av resultat från olika projekt med teknisk färg måste följas upp och utvärderas. Vi från Riksantikvarieämbetet tackar våra samarbetspartners Statens fastighetverk, Svenska Byggnadsvårdsföreningen, Svenska Järnvägsmuseet (Trafikverket) och Hantverkslaboratoriet för ett mycket lyckat Färgforum med en stor spridning av kompetenser bland deltagande och talare. Detta ledde till riktigt intressanta och initierade diskussioner och uppslag för nya forskningsområden och samarbeten! Vad är kemikalier och lösningsmedel för något? Inom reklam kan man ofta höra uttryck som ”helt utan kemikalier” eller ”inga lösningsmedel behövs”. Men hur definieras kemikalie och lösningsmedel egentligen? Och hur är det när man rengör kulturarvsobjekt av sten (som runstenar, bildstenar, hällristningar, gravvårdar och så vidare), kan man göra det utan att använda sig av kemikalier eller lösningsmedel? Många som använder sig av ordet ”lösningsmedel” tänker ofta framför allt på organiska lösningsmedel, som exempelvis etanol och terpentin. Men ett lösningsmedel är en vätska ”som kan lösa upp ett fast ämne, blanda sig med en vätska eller binda en gas och därigenom bilda en homogen lösning.” Lösningsmedel kan vara både organiska eller oorganiska. Vårt vanligaste och viktigaste lösningsmedel är VATTEN. Vatten fungerar som ett lösningsmedel inte bara på smutsfläckarna på våra kläder, utan även som ett lösningsmedel av sten. Tänk på uttrycket ”droppen urholkar stenen”. Skriver en utförare i en arkeologisk rapport eller i en konserveringsrapport att denne har rengjort en sten ”utan kemikalier och lösningsmedel” kan läsaren till exempel få uppfattningen att utföraren enbart har torrborstat stenen. Men eftersom vatten är ett lösningsmedel är det viktigt att det tydligt framgår om någon har tvättat ett kulturarvsobjekt i vatten. (Det är också stor skillnad på vatten och vatten. I en rapport bör det framgå om någon har använt sig av exempelvis destillerat vatten, kranvatten eller vatten från en regntunna). Och för att återvända till jämförelsen med sillen, jämför hur mycket tydligare det blir att skriva: ”När jag lade in 600 gram sillfiléer använde jag mig av 1 dl ättika och 3 dl vatten”, istället för ”När jag lade in sillfiléer använde jag mig inte av några kemikalier eller lösningsmedel”. Det bästa är därför om den som skriver en arkeologisk rapport eller en konserveringsrapport – istället för att skriva vad hen INTE använde sig av – är tydlig och skriver exakt vad hen använde sig av och hur hen gjorde. Svenska byggnadsvårdföreningen arrangerade 8 mars ett studiebesök på Gotland. Besöket var hos Jerry Jannehag, en veteran inom byggnadsvård och dekorationsmåleri. Besöket i ateljén bjöd på en spontan föreläsning och en exkursion bland antika färgburkar och vackra provuppstrykningar. Karin Calissendorff från kulturvårdsavdelningen på Riksantikvarieämbetet berättar. Jerry Jannehag? Han har målat om i mitt hus, tempera, få som ställer upp på det. Jerry? Honom hade jag som föreläsare på kursen.. Jannehag? Han har väl varit igång i uppåt trettio år nu? När jag berättar på avdelningen kulturvård om kvällens tilldragelse vet många exakt vem Jerry Jannehag är, fler har en liten anekdot att berätta. Detta verkar vara en veteran, tänker jag. 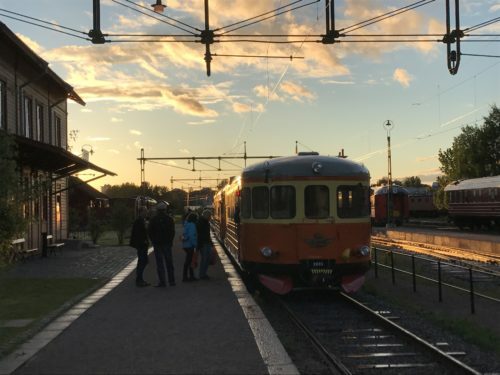 Väl ute i Jannehags ateljé möts besökarna av en man i sin krafts dagar, i en ateljémiljö som vittnar om hög aktivitet och uppfinningsrikedom. Ateljén är en gammal ladugård i anslutning till Dalhems prästgård. Jannehag byggde om den till målarverkstad på mitten av nittiotalet, då han bestämde sig för att starta eget. Jannehag inleder med att berätta om ett uppdrag han gjorde i Lau kyrka på Gotland, åren kring 2000. Projektet var ambitiöst, en predikstol och omgivande snickerier skulle målas om och samtidigt återfå sin ursprungliga kulör. Den nedbrutna färgen på predikstolen var nu brun, man tänkte inför projektet att det kan bara bli bättre. 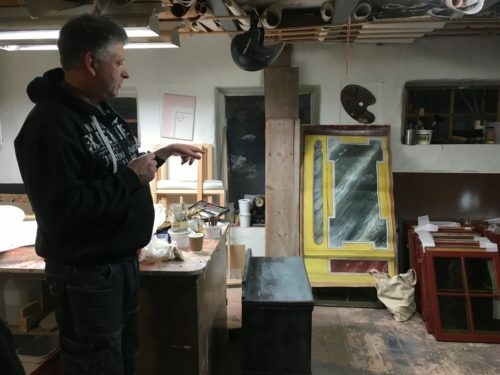 Arbetet skulle genomfördes tillsammans med konservatorn Carl-Henrik Eliason som tog fram en färgsättning, baserat på pigmentanalys. Eliason kunde se att det ursprungliga gula pigmentet var orpiment, ett arsenikhaltigt pigment, även kallat ”dårens guld”. Jannehag och Eliason förstod att resultatet skulle ha blivit för intensivt om de skulle använda den ursprungliga kulören, pigmentet i sig används inte längre. Men de tyckte själva att det skulle vara roligt om man målade med denna häftigt intensiva gula kulör. Jannehag gjorde uppmålningsprov med pigmetet ockragul, ett dämpat gult pigment, för församlingen att ta ställning till. Färganalysen resulterade i att en bruten ockragul kulör användes. Predikstolen målades om. Till Jannehags förskräckelse var huvuddelen församlingen missnöjda. Det var för gult, det såg helt enkelt för nytt ut. Här kan man inte låta bli att tänka att kommunikationen inom projektet – och med intressenterna – inte var fullkomlig. En sak är säker: Det är viktigt att ha med användarna på tåget, genom bestlutsfattandet. Bara för att en kulör är ”enligt original” behöver det inte säkert att den fungerar i sammanhanget, i tiden. När blir det riktigt bra? Jannehag tog sedan upp exempel med nöjda beställare och goda samarbeten. Kunniga och lite krävande beställare är de som blir nöjda, konstaterade Jannehag. Han tänker då på alla byggnadsvårdsentusiaster som köper gamla hus på Gotland. Men Jannehag är inte så imponerad av de nya kulturfärgerna som tas fram. Han använder hellre beprövade, moderna färger än svaga ekologiska färger och en del av de nya giftfria linoljefärgerna. De kan man använda som privatperson, säger Jannehag, inte om man som yrkesmålare ska lämna garantier. Efter Jannehags genomgångar av olika material och metodexempel vill besökarna ha tips för sina egna projekt. En man vill veta hur man blandar till en siennagul till en fasad och en diskussion utbryter om järnvitriol. En kvinna beskriver hur hon blandar sin egen kimrök med askan från ugnen. Det blir mer och mer tydligt genom besöket att en professionell målare har andra ramar att hålla sig inom än en hobbymålare vad gäller materialval. Men det Jannehag inte får i karusellen tar han igen i gungorna. Jannehag har en stor spännvidd vad gäller dekorationsmåleri och visar exempel på ådring och trompe l’oeil-måleri. Jannehag verkar vara rätt man på rätt plats, i den myllrande ombyggda ladugården: ”..ett perfekt sätt att slita ner ladugård på om man inte gillar djur”. Under hösten 2016 har förstudien Byggnadsvårdens behov av laboratorium för färganalys genomförts på kulturvårdsavdelningen, enheten för konserveringsvetenskap. Resultaten föll inte ut helt enligt projektledarens förväntningar. Om man är kulturvårdare på ”fältet”, anlitad i byggnadsvårdsprojekt och förväntas avläsa miljöns behov av konservering och restaurering, vad önskar man sig mest då? Bra projektledare? En realistisk tidsplan? Bra sammanhållning på arbetsplatsen? Riksantikvarieämbetet har uppmärksammat ett annat önskemål. 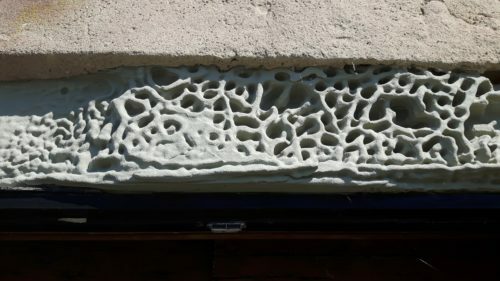 Nämligen möjligheten för landets utförare och beställare av färgundersökningar att få en naturvetenskaplig tolkning av materialprover från byggnadsvårdsprojekt. Bakgrunden till detta, helt kort: Intresset och efterfrågan efter seminarier, kunskapsstöd och analysmöjligheter kring arkitekturbunden färg har ökat i Sverige och i Europa (globalt kan man nästan säga). Sverige har inget centralt laboratorium för färganalys som kan serva utförarna med materialanalyser. Detta har ett flertal professioner inom byggnadsvården saknat, vilket Riksantikvarieämbetet tagit fasta på. Tillbaka till fältet, där konservatorer, byggnadsantikvarier och en och annan målare behöver veta hur en miljös ytskikt ska bevaras. De är förstudiens fokusgrupp, tillsammans med beställarna av byggnadsvårdande insatser. Jag har i förstuden avlockat dem vad de behöver för stöd för att i högre grad utveckla metoder för färgundersökningar och få en vidgad arena för kunskapsbyggande arbete med färg. I intervjuer har det framkommit att det inte är analysstöd de behöver, primärt. Istället behöver alla yrkesgrupper som utför färgundersökningar, stöd att utföra dokumentation och provtagning innan ett projekt drar igång. Verkligheten bjuder ofta på denna arbetsgång inom byggnadsvårdsprojekt: Projekteringen utförs av arkitekter eller ingenjörer. Dessa yrkesgrupper prioriterar vanligtvis inte kulturmiljövård. De har inga entreprenörer eller konservatorer med i planeringsstadiet, även om byggnaden har ett högt kulturhistoriskt värde. 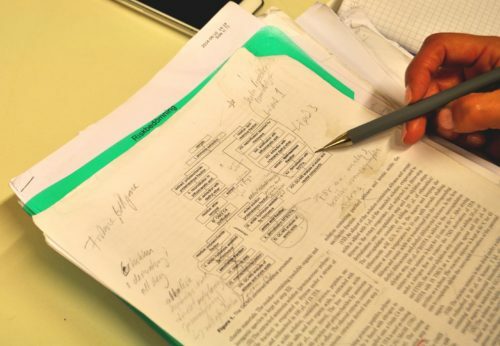 Dokumentation och materialundersökning – som skulle ha skett redan innan tillståndsansökan – blir aktiviteter förpassade till en tidpunkt i projektet när dokumentation har förlorat en stor del av sitt syfte, det att utföra rätt bevarandeåtgärder. Detta leder oss till den retoriska frågan som texten inleddes med: Som kulturvårdare på ”fältet”, anlitad i byggnadsvårdsprojekt och förväntas avläsa miljöns behov av konservering och restaurering, vad önskar man sig mest då? Bra projektledare? Ja! Det behövs bra projektledare och beställare som förstår värdet av dokumentation och analys av det material som står inför bevarandeåtgärder. Vi ser tydligt behovet av ett laboratorium för färg, men det krävs en större efterfrågan som återigen är beroende av beställares initiativ. Nu ska vi på enheten för konserveringsvetenskap arbeta fram kunskapshöjande strategier och skapa en plattform för färgfrågor. Högre beställarkompetens ska öka efterfrågan och kvalitet på färganalys. Samtidigt arbetar vi för att Kulturvårdslaboratoriet kommer arbeta med gästkollegors färgfrågor under 2017 och framåt! Sedan några år leder Riksantikvarieämbetet nätverket PRE-MAL , den svenska skadedjursgruppen (PRE-MAL står för Pest Research Education – Museums, Archives and Libraries). PRE-MAL har sedan starten 1984 hållit kurser inom skadedjursidentifiering, förebyggande arbete och skadedjursbekämpning. 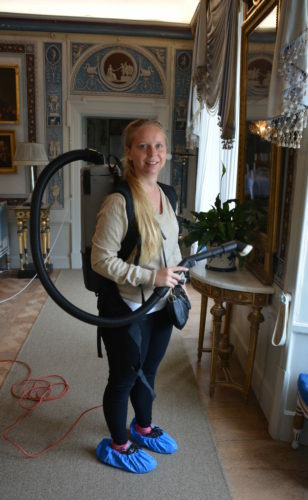 I år hölls, för andra året i rad, en kurs på Julita gård på temat skadedjur, mögel och housekeeping. De tre områdena hänger ihop då det förebyggande arbetet som housekeeping representerar ofta leder till mindre besvär och skador från skadedjur och mögel. Lisa Nilsen och Niklas Apelqvist visar skador som kan förekomma i historisk miljö. Kursen varade i två dagar och innehöll både teori och praktik. Den fantastiska miljö som Julita gård erbjuder gav ett utmärkt exempel på en historisk miljö att öva på. Värdet med kursen är att deltagarna fick arbeta praktiskt med de teoretiska delarna som grund. Niklas Apelqvist instruerar en av deltagarna i identifiering av skadeinsekter. Den del som handlade om skadedjur låg fokus på insekter. Niklas Apelqvist från Naturhistoriska Riksmuseet är entomolog med stor erfarenhet av identifiering av skadedjur och dess ätvanor. Kursdeltagarna fick möjlighet att själva, med hjälp av mikroskåp, identifiera de vanligast förekommande skadeinsekterna. För att kunna sätta in lämpliga förebyggande åtgärder, gäller det att veta vilka djur man har att göra med. Mögel engagerar många både gällande skador på föremål som risker för den personliga hälsan. Aime Must från Aimex visade hur mögel frodas och hur man skyddar sig vid sanering. Aime har arbetat med mögel i kulturmiljöer i många år och är väl insatt i problematiken med mögelskadade föremål. En av deltagarna provar den bärbara dammsugaren. Housekeeping (housekeeping handlar om att arbeta metodiskt med städning och förebyggande arbete) leddes av Lisa Nilsen. Hon har lång erfarenhet av praktiskt housekeepingarbete i Sverige, Norge och England. Med Lisa fick deltagarna lära sig om bra tekniker i förebyggande arbete samt att välja lämplig utrustning och prova att dammsuga med en bärbar dammsugare. Inför kursen fick vi dock be personalen på Julita gård att inte dammsuga upp alla flugor och att städa lite mindre så att vi fick något att öva på! Är du intresserad av att lära dig mer? Kursen riktar sig till alla som arbetar med föremål, kulturmiljöer och förvaltning av dessa. På tidigare kurser har bland annat personal från museer, Svenska kyrkan och städföretag deltagit. Vi rekommenderar alla som arbetar med att förvalta kulturmiljöer och föremål och som vill få fördjupad kunskap om skadedjur, mögel och housekeeping att gå denna kurs. 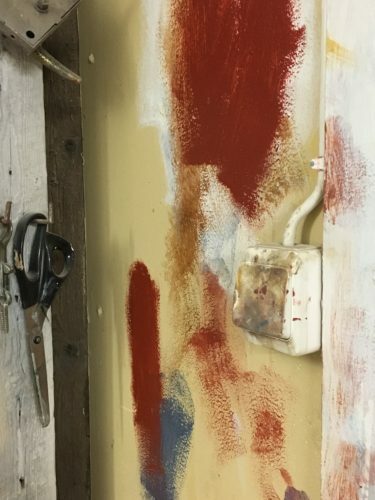 Kurs i skadedjur, mögel och housekeeping på Julita gård. Den del som handlade om skadedjur låg fokus på insekter. Niklas Apelkvist från Naturhistoriska Riksmuseet är entomolog med stor erfarenhet av identifiering av skadedjur och dess ätvanor. Kursdeltagarna fick möjlighet att själva, med hjälp av mikroskåp, identifiera de vanligast förekommande skadeinsekterna. För att kunna sätta in lämpliga förebyggande åtgärder, gäller det att veta vilka djur man har att göra med. Bildtext: En av deltagarna provar den bärbara dammsugaren. Housekeeping (housekeeping handlar om att arbeta metodiskt med städning och förebyggande arbete) leddes av Lisa Nilsen från Lisa Nilsen kulturvård. Lisa har lång erfarenhet av praktiskt housekeepingarbete i Sverige, Norge och England. Med Lisa fick deltagarna lära sig om bra tekniker i förebyggande arbete samt att välja lämplig utrustning och prova att dammsuga med en bärbar dammsugare. Inför kursen fick vi dock be personalen på Julita gård att inte dammsuga upp alla flugor och att städa lite mindre så att vi fick något att öva på! Kursen riktar sig till alla som arbetar med föremål, kulturmiljöer och förvaltning av dessa. På tidigare kurser har bland annat personal från museer, svenska kyrkan och städföretag deltagit. Vi rekommenderar alla som arbetar med att förvalta kulturmiljöer och föremål och som vill ha fördjupad kunskap om skadedjur, mögel och Housekeeping att gå denna kurs. Mitt intresse inom utvecklingsområdet för färgundersökningar har lett mig till Arkeologiska Forskningslaboratoriet, AFL, på Stockholms universitet. Där gästforskar kemisten Yvonne Fors kring materialanalys inom Hälsingegårdsprojektet. Yvonnes uppgift är att peka ut vilka bindemedel som målarna använde i inredningsmåleriet. Frågorna i projektet har varit många och Yvonne har antagit utmaningen att koka ned materialet, både i bokstavlig och i överförd mening. Yvonne Fors har under sin karriär bland annat forskat kring Vasaskeppet och är specialist på arkeologiskt trä. Hon har lång erfarenhet av kulturhistoriskt material och har undervisat i kemi på Institutionen för kulturvård på Göteborgs Universitet. Under besöket i AFL:s labb hoppas jag få se hur hon preparerar färgprover inför bindemedelsanalys med GC-MS (gaskromatografi -masspektrometri) och FT-IR (Fourier transform infrared spectroscopy). När jag möter Yvonne i laboratoriet har GC-MS-instrumentet nått servicesmärtpunkten. Den går inte att tvinga genom en enda analys till. Yvonne har dock inget emot att beskriva processen med ord istället. Eller processerna. Metoden Yvonne använder sker i flera preparerande steg. Vägen till labbet har dock varit lång. Arbetet med ”hälsingefärgen” inleddes med ingående diskussioner med projektets deltagare kring förutsättningar kring provtagning. Avgränsningsarbetet och formuleringen av frågeställningen beskriver Yvonne som grunden till en lyckad arbetsprocess. Varför behövdes denna avancerade analys? I Hälsingegårdsprojektet är konservatorer med lång erfarenhet av färganalyser inblandade. Men att typbestämma bindemedel i nedbruten och oren färg är krävande. Färgskikten som var i fokus bjöd inledningsvis på ovanligt stort motstånd. De var åldrade och hade ett stort innehåll av bland annat krita som gav svårtydda svar i enklare bindemedelsanalys. Projektet kopplade därför in Yvonne Fors som kunde ta bindemedelsanalysen ett steg längre. Metoden med extraktion möjliggör för en mer precis analys i bindemedelsanalysen i GC-MS och FTIR. Extraktionsprocesserna är tidskrävande och metoden är ovanliga för färganalysarbetet som utförs på mindre labb. Vad har Yvonne för metod? Yvonne förklarar att denna metod inte är ny och heller inte hennes påhitt. Liknande metoder används bland annat i Sydeuropa där kemisterna inom kulturvårdsområdet inte sällan hanterar betydligt äldre provmaterial. Yvonne har däremot satt sin prägel på metoden för att den ska vara skräddarsydd för frågeställningen. Eftersom färgproverna från Hälsingegårdsprojektet innehåller en blandning av olika material, krävs det många renande steg genom extraktion. Yvonne visar mig ett avancerat flödesschema som visar vägen mot identifiering. Pappret innehåller också Yvonnes anteckningar och hon skrattar och säger att detta är ryggraden och rättesnöret som hon regelbundet checkar av mot och fingrar på. När preparaten är renade kan Yvonne köra materialet i GC-MS som ger de grafer med toppar som ger indikationer om det organiska innehållet. Nu kan Yvonne jämföra resultatet med det referensmaterial som hon tidigare analyserat enligt samma metoder och försöka hitta likheter. Kan man förenkla denna metod och applicera den i en enklare labbmiljö? Tyvärr kan man inte skala ned processen allt för mycket. Då når man inte information om bindemedlen på den detaljnivå som är nödvändig för att få ett kvalitetssäkrat svar. Analysarbete tar tid, sammanfattar Yvonne. Hur upplever Yvonne det interdisciplinära arbetet? Denna fråga tycker jag, Karin, är väldigt intressant och ger mycket information om hur vi ska kunna samarbeta bättre i interdisciplinära projekt på hög nivå. Yvonne är beundransvärd i sitt engagemang i att nå framgång i samarbetsprojekt och lösa pedagogiska utmaningar. Att gemensamt mejsla fram en frågeställning för analysarbetet krävde lite tid och tålamod. Men när frågeställningarna var på plats, var Yvonne igång i Hälsingegårdarna med provtagning och skapade sig en mer holistisk upplevelse av miljön och materialet. Något som Yvonne tycker är av största vikt. När får vi veta innehållet i ”hälsingefärgerna”? Hälsingegårdsprojektet är finansierad av Vetenskapsrådet och forskning har krav på publicering i vetenskapliga tidskrifter, helst sådana med hög ”impact faktor”. Yvonne behöver dessutom skriva två artiklar, en som beskriver analyserna med FT-IR och en som beskriver detsamma med GC-MS. Det gör att resultaten från hennes delprojekt kommer att presentera till en bredare publik först därefter. Besöket ökade min respekt för kemistens arbete och hoppas att Yvonne Fors kommer figurera i fler färgrelaterade projekt som skjuter fram positionerna för vårt gemensamma intresse för färg och kulturvård! Projektet ”Dekorerade interiörer i Hälsingegårdar – en holistisk studie av ett kulturhistoriskt Världsarv” är ett tvärvetenskapligt forskningsprojekt. I projektet ingår conservation scientists, kemister, fysiker, konservatorer, etnologer och konstvetare. Forskningledare är FD Ingalill Nyström från Göteborgs Universitet. Jag som är projektledare för studien ”Byggnadsvårdens behov av laboratorium för färganalyser” heter Karin Calissendorff och arbetar tillsammans med Kathrin Hinrichs Degerblad, Helena Grundberg och David Edvardsson på enheten för Konserveringsvetenskap på Riksantikvarieämbetet. Projektets främsta frågeställning är hur kulturvårdlaboratoriet fortsättningsvis ska fördjupa sig i byggnadsvårdens behov och ge aktörerna möjlighet att ta beslut med naturvetenskaplig grund.